This post is sponsored in conjunction with #BrunchWeek. I received product samples from sponsor companies to aid in the creation of the #BrunchWeek recipes. What do you get when you combine tender-crisp asparagus, crispy bacon, and gobs of melty cheese between two slices of sourdough bread? 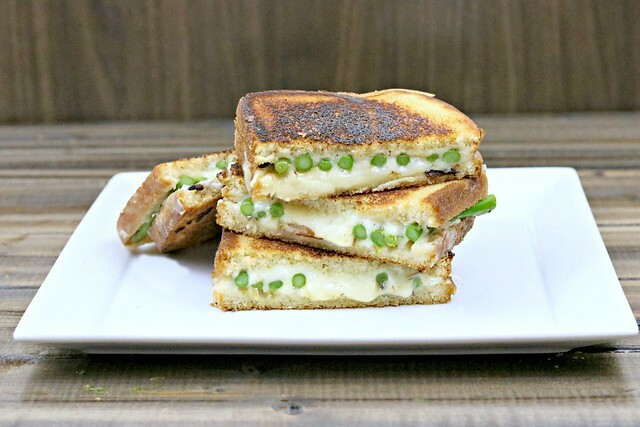 Just about the best grilled cheese you’ve ever had, that’s what!! Welcome to the final day of #BrunchWeek! I hope you entered the giveaway and checked out all of the other amazing recipes that have been posted this week. There are some great ones, for sure!! I decided to close out the week with a hearty dish, that is a little outside of the box, as far as grilled cheeses are concerned. J was super skeptical when I first told him that I was going to use the Michigan Asparagus in a grilled cheese. When I told him I was adding bacon, I think it eased his mind a little bit, but he still doubted my sanity I’m quite sure. Oh, and using the Seriously Sharp cheddar from Cabot Cheese, was definitely the right choice. And as skeptical as my dear hubby was, he loved these grilled cheeses. Like, really loved them. 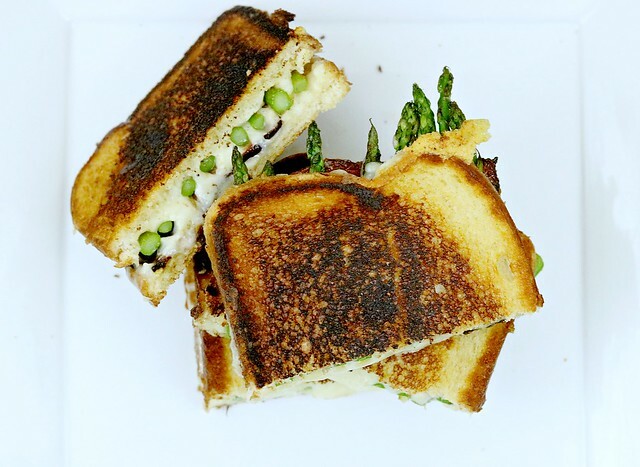 There’s just something about the tender-crisp asparagus and crispy bacon in the middle of melty sharp cheddar cheese and butter-toasted sourdough bread that just can’t be anything but right. Oh so right. I mean, we love asparagus, we love bacon, and who doesn’t love cheese?? So, the combo – weird as it may sound – is a match made in grilled cheese heaven. It’s a wonder I was even able to steal them away to take pictures, honestly. I think J was playing with the baby so I was able to quickly sneak into the other room before his nose detected that the bacon-y goodness was ready to devour. And devour we did. After the photos, of course. They were so good, in fact, that I immediately started thinking of other veggies I could crisp up and stick in the middle of a grilled cheese. Turns out, others have had the same ideas! 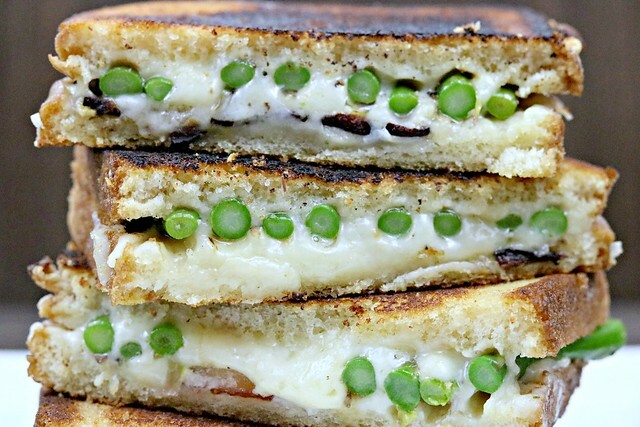 Veggie grilled cheeses are popular!! I first contemplated just using the asparagus and cheese, but something told me that the adding bacon would be an even better idea! Because, what doesn’t bacon make better?? But, if you prefer to go the meatless route, you could just omit the bacon portion of the recipe. 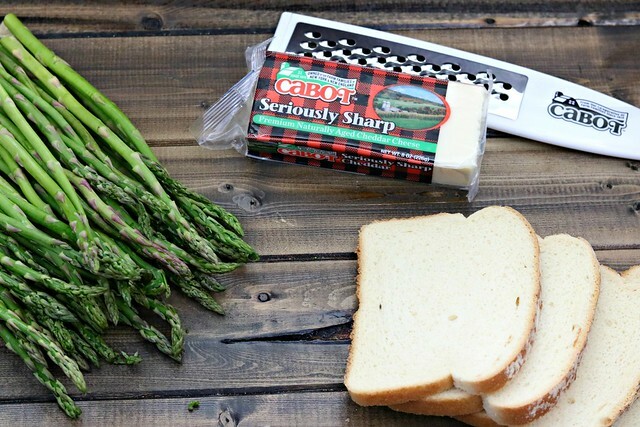 You could even use your favorite variety of cheese, though I highly recommend the Cabot Seriously Sharp. It really did go perfectly with the salty bacon, buttery sourdough, tangy Dijon, and the garlicky Michigan asparagus. High quality ingredients really do make a world of difference. This is asparagus harvesting season, in case you didn’t know. 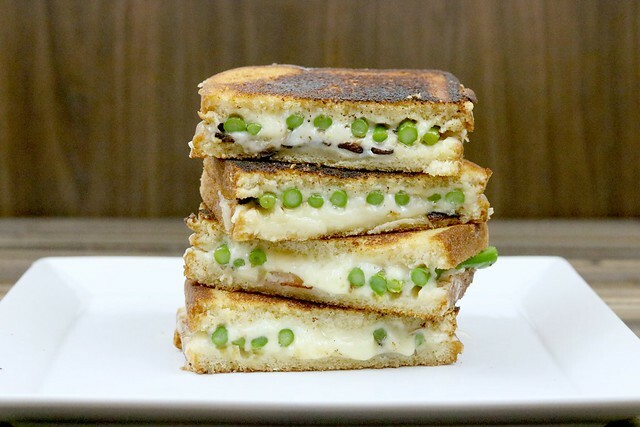 So, freshly plucked and smothered in Cabot’s amazing cheese – not to mention bacon and sourdough bread – definitely elevates this already unique grilled cheese to the next level. 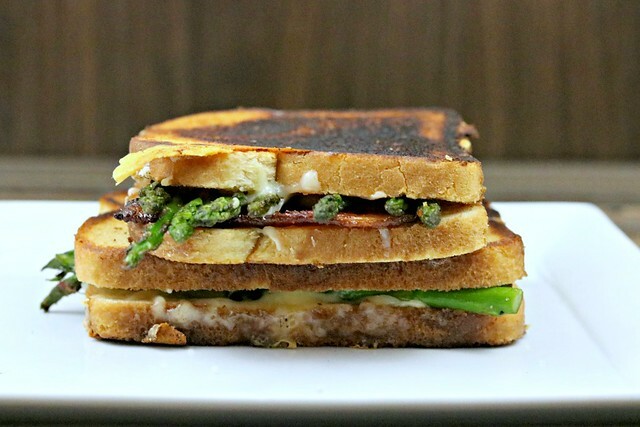 What do you get when you combine tender-crisp asparagus, crispy bacon, and gobs of melty cheese between two slices of sourdough bread? Just about the best grilled cheese you've ever had, that's what!! Heat a large skillet over medium heat and cook the bacon until nice and crisp. Remove to a paper towel lined plate until ready to use. Drain the bacon greats and wipe the skillet out with a paper towel, the remove to the stove. Heat over medium-low heat and add the olive oil. Add the asparagus and garlic, and sprinkle with salt and pepper. Cook, stirring often, until the asparagus has softened and looks a bit roasted. Remove it and set it on a plate. Wipe out your skillet again and return to the stove, over medium heat. Add half of the butter and allow to melt. The carefully place your prepared sandwiches into the skillet and allow to cook for a couple of minutes, until nicely browned and crisp. Carefully flip and repeat until browned and the cheese is good and melted. Remove from the skillet, allow to sit for just a minute, then slice each sandwich in half, and serve!